The Paraphrases is a collaborative work that features 24 variations and a finale by Cui, Liadov and Rimsky-Korsakov, followed by a brief transition by Liszt and 15 short pieces by Borodin and the three mentioned above. The work is for two pianos, the second of which plays the same motive over and over throughout, while the first plays more substantive music. In the end, the work ends up as a failed attempt to create the sublime from the simple, because it falls victim to monotony long before its half-hour-plus duration is up. Too bad, because many individual pieces and variations are cleverly conceived and written. The Shostakovich Aphorisms fare better, but not much. More and more I'm becoming convinced that Shostakovich's piano music generally falls far below the level of his chamber music and concertos for string instruments. These short pieces sound like improvisations, experiments in a style not dissimilar to Shostakovich's fantastic opera, The Nose, but without that work's biting satire and artistic sense of purpose. The Op. 87 Prélude and Fugue in D Flat is worth attention, but, alas, is but one choice nugget from what is perhaps the composer's most substantive work for piano. Scriabin, while not necessarily a mainstream figure to many, is still a composer of importance in my view, and becomes the lone reason for the potential buyer to acquire this disc, especially because of the ethereal and agitated reading of the Fifth Sonata. Still, three of the Préludes here appear on the other disc. 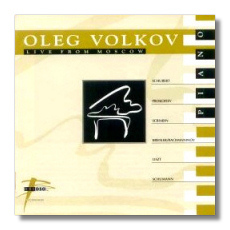 Throughout this recording Oleg Volkov displays his usual deft pianistic and technical skills. He makes about the best case imaginable for the lesser pieces and is an excellent interpreter of the highly individual Scriabin Préludes and sonata, capturing the mystical and intense nature of the latter piece with keen insight. 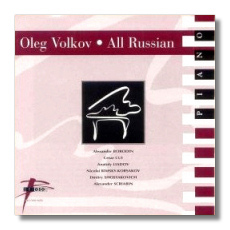 Those same skills are in evidence in the much more rewarding second disc, culled from a 1994 Moscow concert. While his Schubert could be more elastic and quirky, and his Prokofieff more athletic, he is still sensitive and manages to effectively convey the spirit of these very different compositions. Träumerei is a bit on the slow side, but still touching. The Rachmaninoff transcriptions are full of color and sparkle, full of subtle shadings and impressive virtuosity. Ditto for the Liszt Gnomenreigen. And his Scriabin, as on the other disc, is compellingly rendered. By the way, Volkov's playing in this live concert is amazingly accurate throughout. In sum, most selections on both discs are spendidly played and are presented in good sound. The notes by Volkov's pianist/musicologist wife, Svetlana, are most informative and very thorough. I wish all labels supplied such intelligent and copious commentary with their discs.